My new love! The Babouska Rose Blanket. I am making this blanket, and have documented some tips for maximized results, so I decided to write some pattern support. Here is a square from the pattern, with my modifications that I documented below. Posted in Babouska Rose, Free PatternsTagged Blanket, Crochet, Flower, PLT join, Rose, TutorialBookmark the permalink. According to the pattern, it’s 5 stitches in each petal for petal rounds 1 & 2, for petal round 3, it’s 7 stitches per petal. I didn’t modify it – came out great! A beautiful blanket, I love it. Gorgeous jewel colours too. I wish I could read charts. Maybe one day soon I will figure them out. Hace you learned to Read charts yet? Could you pls explain the meaning of the sc stitches in circles and also those circled twice..
Pingback: Get your Surf on! | Tinker, Tailor, Sweater, Sigh! Thank you so much! 🙂 You’re so kind! Reblogged this on Crochet with Smile. 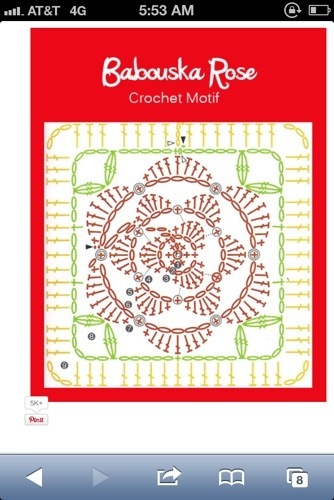 Hi, I can’t stop admiring your beautiful rose crochet.However how do I read the crochet pattern from the chart.Will appreciate your help in this. Last time i looked, this was a paid pattern. So I was curious, is it now free for this gorgeous pattern? i have to try again to recover files from old computer. I’ve had a crash and lost ALL data – including hundreds of patterns, some of which I had to buy. I know I had bought this Babouska Rose – I fell in love with it the first time I saw it! 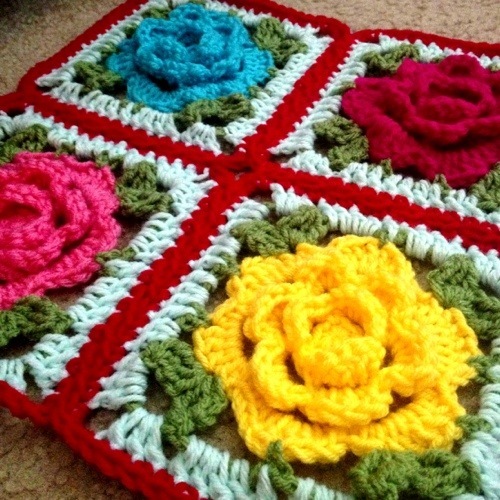 I would like the pattern for this rose afghan. I would also like your idea on working this pattern with the roses as a coat. Please respond. How do you print the free patterns? I have nothing but problems in trying yo print a Grayy Rose Afgan pattern.